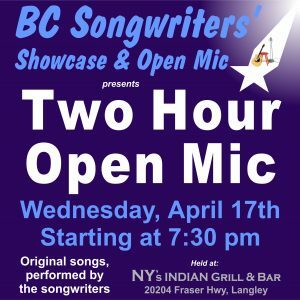 The “All-Night-Open-Mic” nights have become very popular! As long as the crowd keeps coming… we’ll continue having them! Join us this Wednesday, April 17th at 7:30 pm for another! Sign up is “in person” only, in a first signed up, first on stage, basis… to be able to perform a couple of your original songs. 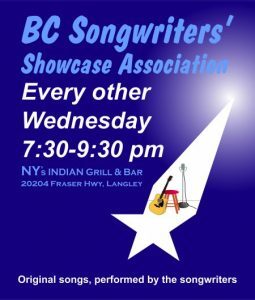 It all happens at NY’s Indian Grill & Bar – 20204 Fraser Hwy, Langley.